Global Witness, the international anti-corruption organization, published the report, named "Risky business. Who controls Kazakhmys plc?" Based on independent investigation information, Global Witness affirms that Kazakhmys, the biggest Kazakhstani copper miner, did not share vital and financially important information with the investors when it was listing its shares at London Stock Exchange in 2005. The information included close corruption ties of senior management with President Nursultan Nazarbayev. Each company, going to enter the London Stock Exchange, must provide information about beneficiary owners of shares in the last five years while the top management and board of directors’ members must supply information about their links with state officials. It is important for the investors to know whether state (or ruling officials) can influence this company and what changes to expect if the regime in the country is also changed. The investors, putting money in the stocks of various companies, orient at FTSE100 prestigious exchange index, constituted by biggest companies of the London Stock Exchange. Kazakhmys is FTSE100 Company; therefore, non-supply of important information may produce distorted image about investment risk for Kazakhmys. Global Witness report warns big investment funds, including British pension funds, that Kazakhmys is not transparent and that investors risk their money, investing funds in company that does not provide full and unbiased information. Kazakhmys plc was listed in the London Stock Exchange in October of 2005. The Initial Public Offering attracted over 491 million US dollars. Within three months Kazakhmys plc was already listed in the FTSE100 index along with such mining companies as Rio Tinto and BHP Billiton. Kazakhmys is attractive investment target, operating 20 strip pits and mines. It is one of the top ten copper producers in the world ("mys" means "copper"). In 2009 the company’s revenues reached 1.63 billion US dollars. KMPG, the initial auditor of Kazakhmys, refused to continue working on listing (the expert inspection of stock prior to IPO), saying that it needs much more time for comprehensive audit. The audit was completed by Ernst & Young that involved 156 experts in the team. 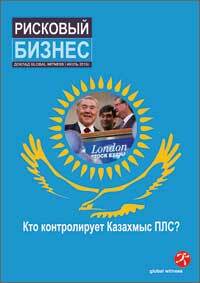 The Global Witness report covers the investigation of Kazakhmys. Many sources indicate that top managers (and biggest shareholders) have strong ties with Nursultan Nazarbayev. "We have no full and 100 percent confirmations of these statements, but they come from the number of Kazakhstani sources, including politicians, civil society and journalists – the report says. - We are concerned that Nazarbayev may impact the decision making process within the company, not in the interests of minority shareholders. These statements also assume risk of punitive measures against the company in case the opposition forces take over the power in Kazakhstan". The ties of President with biggest owners of Kazakhmys will increase the investment risk. The report briefly notes that Kazakhstan is an autocracy ruled by President Nursultan Nazarbayev, who enjoys immunity from prosecution despite having allegedly received bribes in the amount of 78 million US dollars from foreign oil companies in the 1990s in the so-called Kazakhgate scandal. The regime of Nazarbayev is also the risk factor for the investment. "Kazakhstan has not made significant steps forward in fighting corruption. Kazakhstan shows signs of being a ‘kleptocracy’ – a country run primarily in the interests of the ruling family and its associates. Members of Nazarbayev’s family are reportedly worth billions of dollars and hold senior positions in state businesses. As recent events in neighboring Kyrgyzstan show, kleptocracies can lead to instability, disorder and ethnic violence, as citizens remain poor while the elite get richer". Global Witness believes that President’s family is closely tied with Kazakhmys and its managers. The report outlines biographies of Vladimir Ni (the Chairman of Board of Directors) and Vladimir Kim, the CEO of Kazakhmys plc. Many sources, including Rakhat Aliyev and Mukhtar Ablyazov, interviewed by Global Witness, report the ties between President and Kazakhmys. Vladimir Ni worked in Nazarbayev’s office for a long period and he is one of the persons, very close to President. Nine sources of Global Witness named him as the major connection point between the President and Kazakhmys. Vladimir Ni is as influential as Prime-Minister and President’s son-in-law Timur Kulibayev. The sources also referred to him as unofficial treasurer and secret advisor of Nazarbayev. Three sources, interviewed by Global Witness, said that the appointment of Vladimir Kim as CEO "became possible not due to his business leadership, but due to allegiance to the president". Global Witness sources said that Vladimir Kim is nominal CEO, not able to make decisions without getting approval from Ni and Nazarbayev. According to Global Witness, in 2009 Vladimir Kim’s revenues in Kazakhmys plc reached 1.81 million pounds, including salary, non-cash transfers and yearly bonus. At the same time non-executive Director of Kazakhmys plc Vladimir Ni received 415 thousand pounds. In 2006 Mr. Kim unexpectedly presented 2.5 percent of Kazakhmys plc stocks (about 135 million pounds) to Mr. Ni. The official reports described this event as awarding Mr. Ni "for long term business relations with Mr. Kim". According to the report, Kazakhmys plc is not an independently run company, but has the potential to be an instrument of an undemocratic leader in a country that is perceived by many observers to be corrupt. This relationship would create a conflict of loyalty with the potential to affect the company in a way that may not be in the interests of the company’s minority shareholders. The report also mentions that President’s brother Bolat Nazarbayev was Kazakhmys board of Director’s member in 2004, prior to IPO in London. Among the numerous evidences, serving the needs of President Nazarbayev, Global Witness also mentions the aircraft, purchased by Kazakhmys for the President of Kazakhstan. In November of 2007 Vladimir Ni was blamed that he, as the assistant to President, processed the deal of buying the aircraft for Nazarbayev. In response, he was arguing that Kazakhmys bought the aircraft, which was further sold to the state. However, the Global Witness did not find a single documented reference either to purchase of the aircraft or its sale to the state although the shareholders must have been informed about this deal. The report offers the audio files, indicating that over 20 million US dollars were transferred by Kazakhmys to President’s Nur Otan party. One more evidence is the copy of a hotel bill for Nazarbayev’s stay in the Lanesborough Hotel, when he stayed in the United Kingdom on an official visit in November 2006. The bill is for around 29,000 pounds and was sent to a Mr John Rosewell at Kazakhmys plc. The bill includes over 1,600 pounds of dining and beverage charges made from 19 to 23 November, 2006. The bill appears to have been paid in advance by a bank transfer from Kazakhstan. Global Witness asks why the President’s stay was paid by Kazakhmys. "We tried to reach Mr. Rosewell – report says – but the operator informed us Mr. Rosewell was not listed as Kazakhmys plc employee. Lanesborough Hotel provided no comments on this matter". Global Witness addressed Kazakhmys plc with the request to comment on these claims. It has to be mentioned that the report has many evidences, indirectly showing the affiliation with President Nazarbayev. If the corruption does not stand behind these facts why Kazakhmys preferred not to answer the report questions of Global Witness? Global Witness also asked Financial Services Authority (FSA) how they audited Kazakhmys. However, FSA also preferred not to talk to Global Witness, arguing that "the provision of requested information does not match public interests". Global Witness also directed a letter to JP Morgan Cazenove, the financial sponsor of Kazakhmys plc listing, which also remained unanswered. "We have an impression that all main organizers of Kazakhmys plc listing say: we cannot provide you with details, but you need to trust us", conclude the experts of Global Witness. Global Witness believes that relatively "easy" access to stock market in Great Britain (compared to one in USA) is one of the reasons why the companies prefer to be listed in London. Therefore, in the opinion of Global Witness, it is necessary to enhance the rules and call to account those companies, not observing the rules. The Global Witness report may instigate another audit of Kazakhmys plc. Global Witness demands from FSA to investigate the listing story of Kazakhmys and check the validity of supplied information. FSA must also make Kazakhmys answer the report questions on ties between the top management and President Nazarbayev; Kazakhmys transfers to Nur Otan, the ruling party in Kazakhstan; sale of aircraft to the state. Kazakhmys must announce the reasons that motivated to appoint Bolat Nazarbayev as the board of directors’ member in Kazakhmys LLC in August of 2004; why the company received a hotel bill for President’s stay in London. Global Witness could not explain why the Kazakhmys top management was able to acquire nearly all corporate shares before IPO and who the beneficiary owner of Kazakhmys was in the pre-listing period. Until these issues are cleared up, Global Witness recommends increasing the freely floating shares to at least 50 percent stake – in this case, the majority of stocks will not be controlled by either party. So far only 37 percent of stake is offered at the market. If this move is impossible Global Witness recommends firing Vladimir Kim and appointing "totally independent Chairman of Board of Directors". On the other hand, the experts do not specify where to look for "totally independent Chairman" in Kazakhstan.